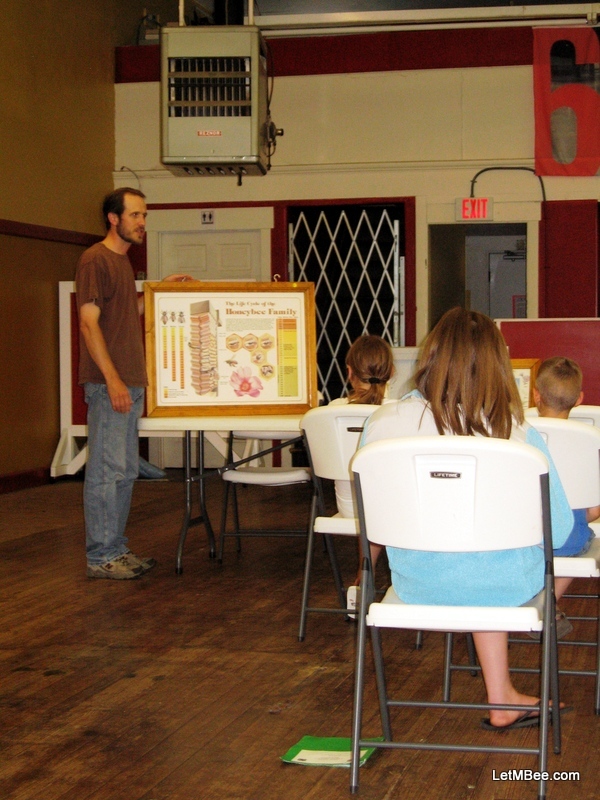 ← What is Natural Beekeeping? 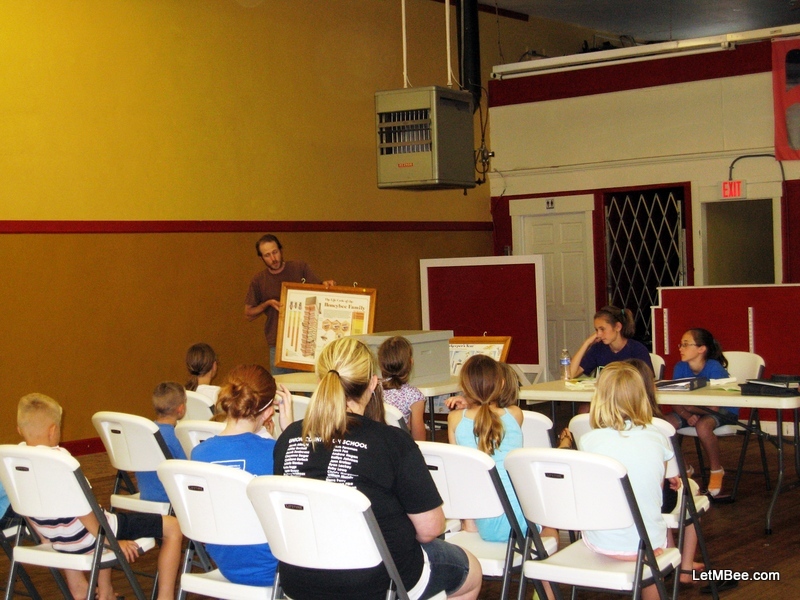 Last week I had the opportunity to speak to Jada’s 4-H group about something I like to talk about. Holly said something months ago about meeting the group for a basic introduction to bees. Time passed and I had not gone to a 4-H meeting. As with all things “beekeeping”, I didn’t know what to I was getting into, and as usual I got more out of it than expected. Poster on the life cyle of bees. I was a worried about speaking to a younger group. I guess the ages ranged from 6 to 14 years. I was afraid of being above the heads of some, while being too basic to hold the interest of others. I have been accused, correctly I might add, of lacking patience. So teaching anyone, let a lone young people gives me the opportunity work on it. I don’t know why I was concerned. They were all very respectful. When we started they were at attention seeming generally interested. I kept it simple, with an overview of the queen, drones, and workers and all their jobs in the hive. We worked our way through the hive, importance of pollination, and what bees are up to during each of the seasons. I thought I had their attention, but didn’t know if they were interested. I couldn’t believe it. After I was done I asked if there were any questions. The majority of the group members did have questions. They had been paying attention, because they were all quality questions. It went on for 15 minutes. Parents were peeking in the back door as we were handing out plastic spoons dipped in honey. Looked at my phone…. 20:45…. things were supposed to be wrapped up by 20:30. I probably ruined any after-meeting plans for the group leader. She had to put everything away and tidy the place up. The group helped with everything except the heavy lifting. Holly and I moved tables and chairs, packed our stuff in the car, and headed home. If someone approaches you about this kind of thing. I would consider making time for it. It provides an opportunity to review your basic bee info. Who knows, you might even get someone interested in bees. This entry was posted in Posts, What's going on.. and tagged bee genetics, beekeeping, Indiana beekepeing. Bookmark the permalink. I’m so happy you did that. Education is so important! I wish every beekeeper would take the time to educate everyone around them. Most people have no idea how important honey bees are to pollination and to the world. I find once people learn more about bees they really want to do what they can to help them as much as possible. If you give them little things they can do to help (like planting for bees, calling a beekeeper not an exterminator if they see a swarm, knowing the difference between honeybees and wasps, hornets etc, buying only raw local honey) they really feel good about doing it. A school I gave a talk to is now getting hives for the students next year to learn more about honeybees. It’s great to see young people so excited about the plight of bees. Great job! This is cool you gathered so much interest. Maybe you could help get a few of these kids started beekeeping? Our bee club sponsors 2 hives to 2 different 4Hers every year. The last meeting a young man 10 year old gave a really nice power point presentation about his first year keeping bees, still no stings. The kid was awesome. How do you determine who will receive the hives? I could probably handle the budget of one per year. Not all of the youth of America is lost. Some of those youngsters had some serious electrical activity going on between their ears. It was good to see. I’m glad you and Anita are out there teaching the kids. I’m seeing a serious change in folks’ attitude towards bees. When we went to pick up the swarm last weekend, the neighbors stayed around and offered lots of help. I was frankly surprised! I thought people would want to run away. These bees, on the report we got, had stung a dog earlier that day, so I was surprised these people stuck around. The bees were perfectly nice to us. It is awesome when they act like they are at least a little interested.